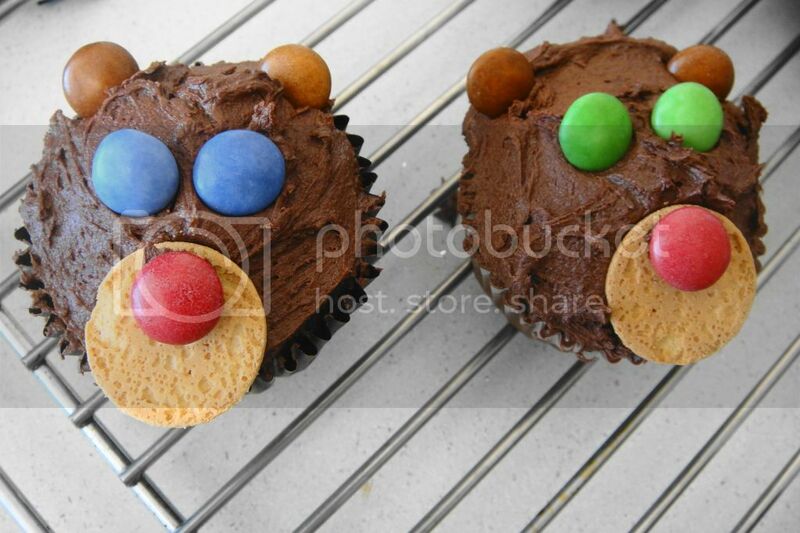 I found a picture of a bear cupcake whilst browsing the Internet. 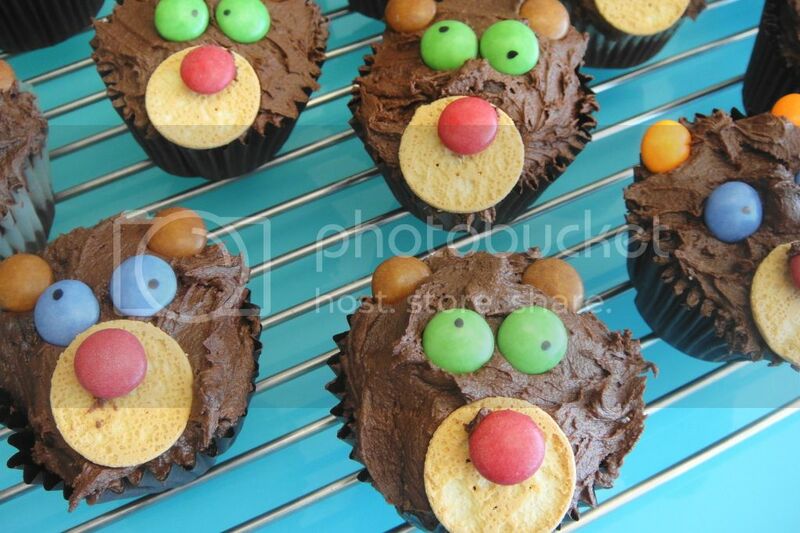 And it inspired me to try my own version of Baby Bear Cupcakes. 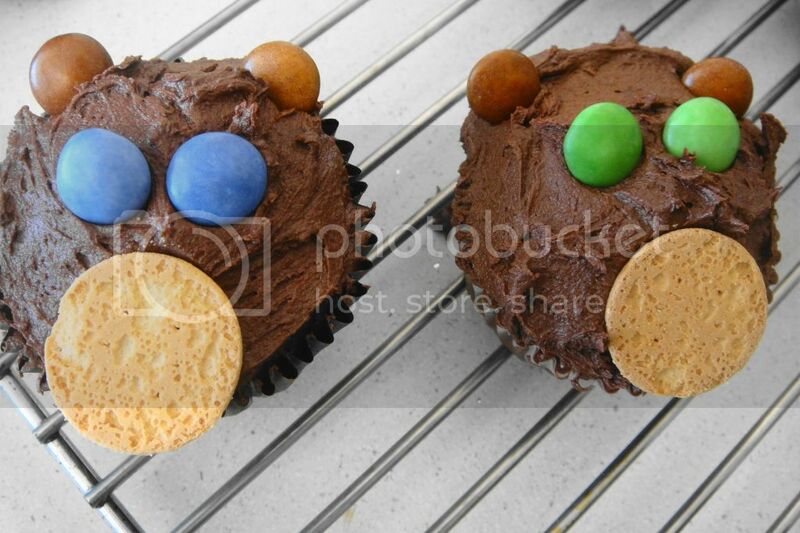 My cupcakes look nothing like the picture I found and are considerably more amateur and juvenile, but they are still incredibly cute and make me smile every time I look at them. 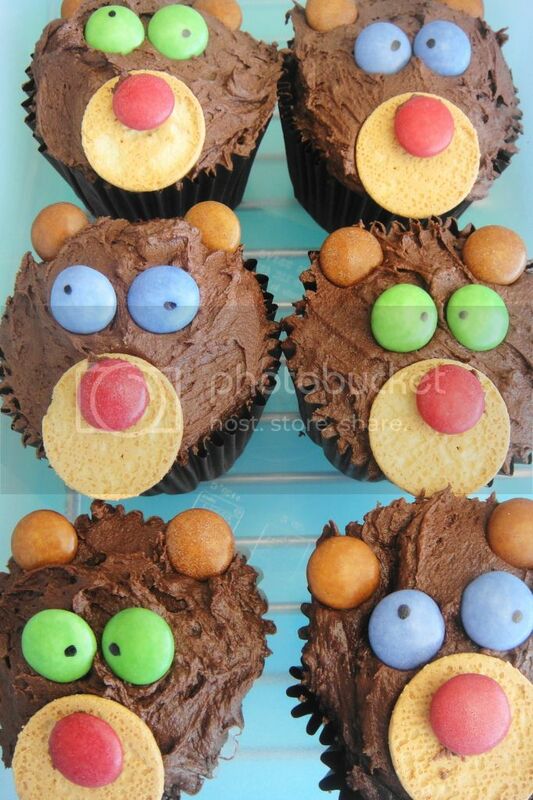 I recently watched the movie Brave (yes, the children’s movie…) and the 3 little brothers that get turned into bears make me think of these funny little cupcakes! All you need to make them is about a dozen chocolate cupcakes, enough chocolate icing for these 12 and a little extra, a whole load of smarties and a packet of mini Marie biscuits. I’m going to run through the process from start to finish – but if you have a preferred cupcake/ icing recipe then go with that and just copy the decorating step at the end. These cupcakes are super easy. get all the ingredients and throw them in the blender – DONE. Okay – it’s easy, but not that easy. First set your oven to 200 C. If you have a fan plus option on your oven, set your oven to 180 C. Then take all the ingredients EXCEPT the milk. Put those ingredients in the blender and blitz until all mixed together. Then add your 3 tbsp Milk – blitz until properly mixed in. And Voila! Cupcake batter done! So easy! And the best part – no sifting needed!! Then spoon the batter into 12 cupcake cases. 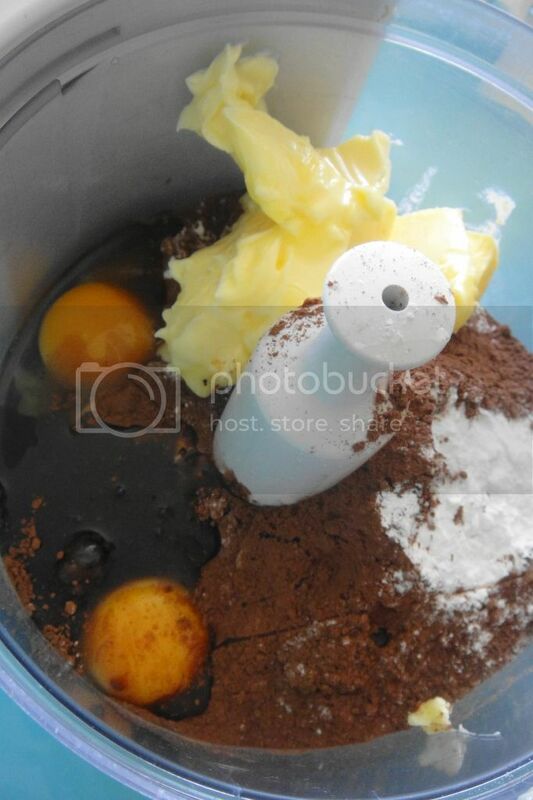 I found this batter comfortably filled 14 cupcake cases, so if you want to add the additional 2 go for it. 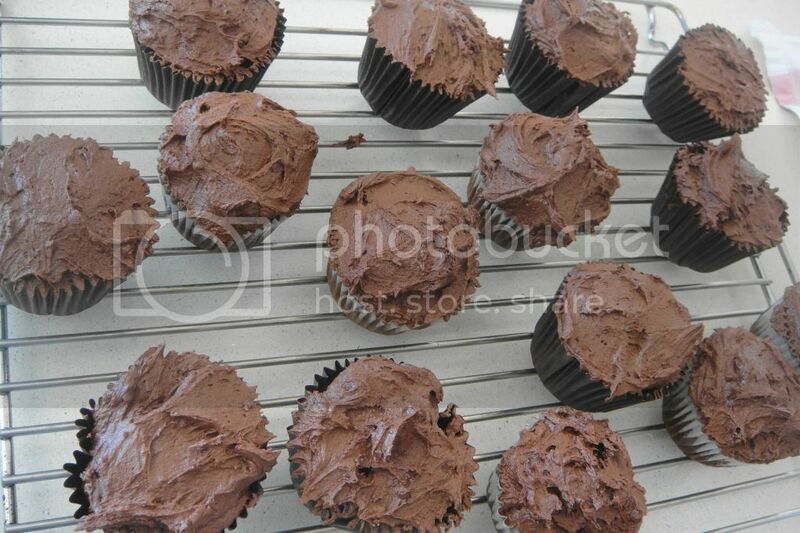 Place your cupcake cases in the oven for 15 – 20 minutes. Mine needed 20 minutes, but I would recommend setting a timer for 15 minutes and checking whether they are ready. To check if they’re ready you simply push a knife through the middle of the cupcakes; if it comes out clean, they are ready! There is nothing worse than dry cupcakes so it’s always good to check! This icing is really good – I hadn’t tried it before but it is now my favourite ‘go to’ chocolate icing. 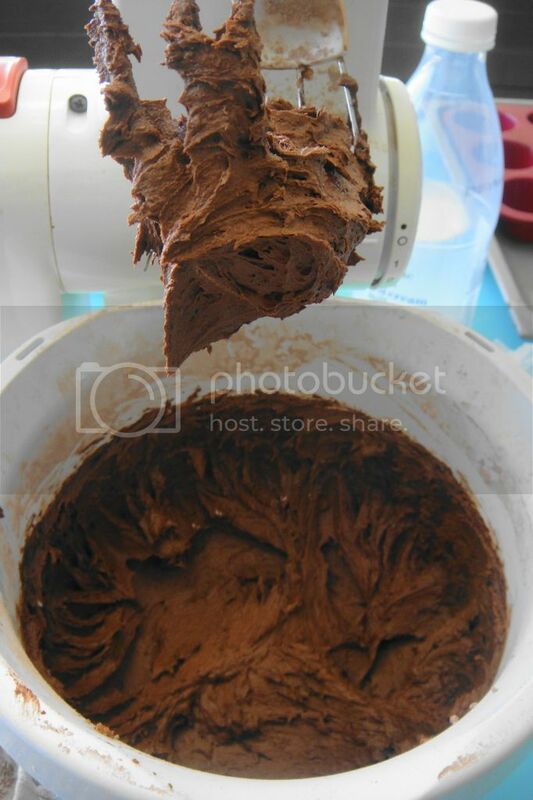 You need 300g Icing sugar, 100g softened butter, 40g cocoa powder, 40ml milk and a handful of chocolate chips. Once again it’s really easy – sift the 300g icing sugar into your mixing bowl, add the 100g softened butter and the 40g cocoa powder. Mix together until as smooth as possible. Then add your milk and mix until smooth. For the chocolate chips (you can very easily substitute with a few squares of chocolate): melt the chocolate chips/squares of chocolate, pour it into the mixture and mix again until the icing is smooth. This icing should be fluffy and chocolatey and oh so good! And you will need 12 mini Marie biscuits or any small kind of round biscuit you prefer. 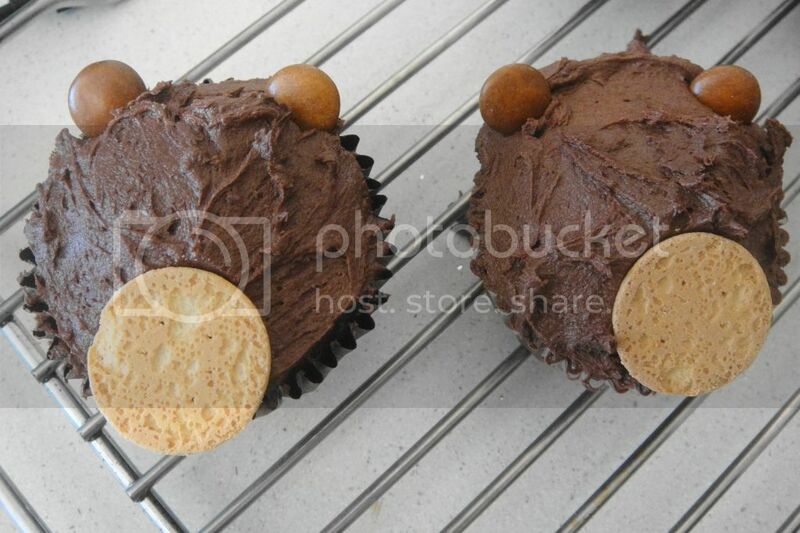 2- Place a Mini Marie Biscuit on the lower half of the cupcake – this will be the nose. 4- Place either 2 green / 2 blue smarties half way between the ears and the nose. You can place them close together and slightly upward tilting for a more comical look. These will be the bear’s eyes. 6- Using a marker pen draw a dot on each eye to give them pupils- lots of mine turned out to be squint because it just looks so funny! !